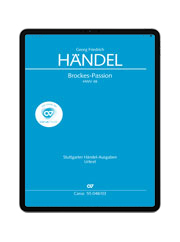 Brockes-Passion. 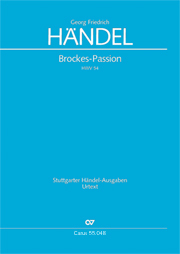 "Der für die Sünde der Welt gemarterte und sterbende Jesu"
Barthold Heinrich Brockes’ text for the passion oratorio later named after him is among the most influential and well-known Passion librettos of the early 18th century. 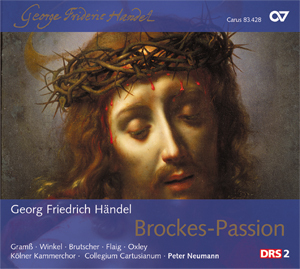 The present version is the first recording on CD of the work based on the copy made by Johann Sebastian Bach himself. It is distinguished from the more well-known version by a different text underlay for the opening chorus. 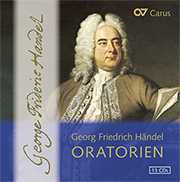 Not one of Handel's best-known compositions; there are very few recordings, and that makes the Carus recording all the more worthwhile. It is a performance which sets a standard that will be difficult to surpass. There is an impressive coherence between soloists, choir and orchestra - it is a performance without a weak link. A highly important addition to the catalogue of Passion music.